Today’s review comes in as a special request from our Facebook page. 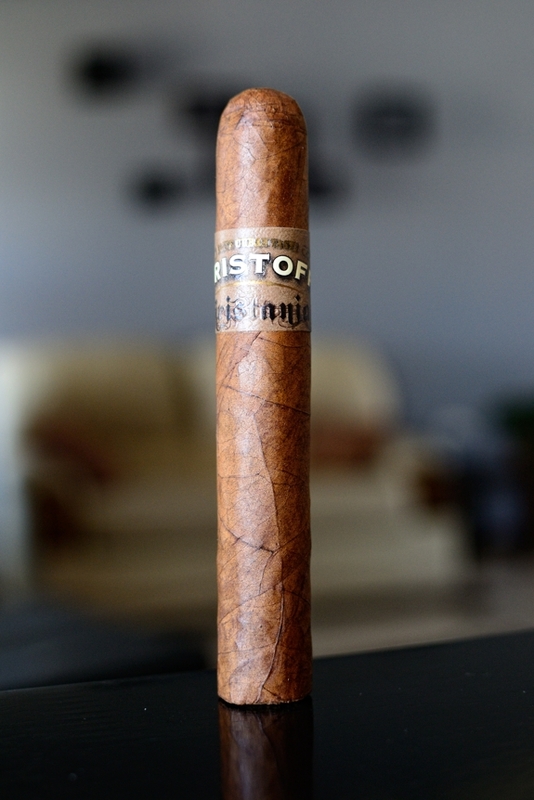 Joe Valdivia had asked me to review a Kristoff he saw in my humidor, said cigar happened to be this very Kristania Robusto. If you guys ever want to see a certain cigar reviewed by Daniel and I, just let us know! One of the easiest ways to get a hold of us is within the comments section on any review, or on our Facebook Page. The Good Stuff: As cigar prices continue to skyrocket, there are a few cigar companies out there doing what they can to reduce the dent made on cigar smoker’s wallets. Kristoff is amongst those companies as they created the Kristania with value in mind. The Kristania originally debuted at the IPCPR trade show in Las Vegas in 2011 and has been rolling out to retailers ever since. The Kristania starts off with a Nicaraguan Criollo wrapper poured over a Dominican Habano binder and filler. 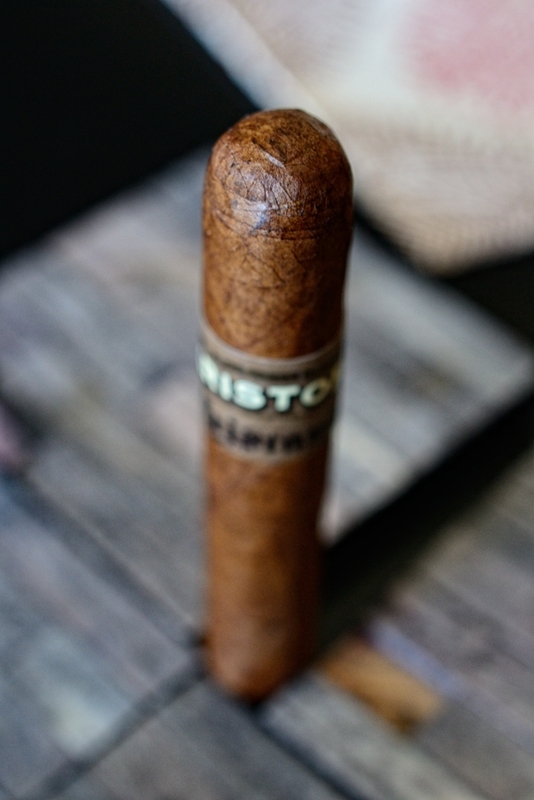 The Kristania comes in 3 sizes, the Robusto (5×50), the Toro (6×52), and an unnamed size (5.5×60) and come in at a very modest price, ranging from $5 – $6.50. 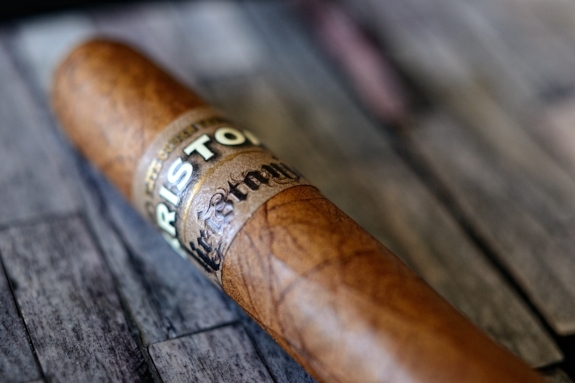 Prelight: This Kristoff Kristania is the epitome of a rustic looking cigar. 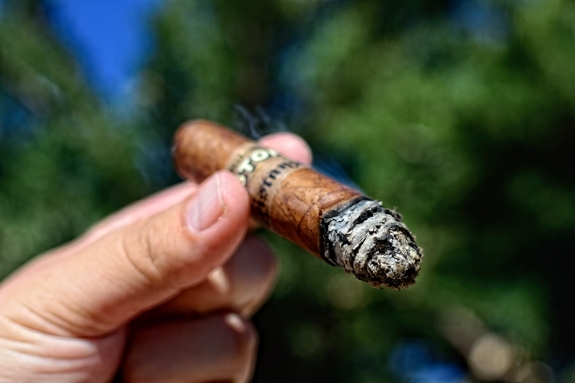 Seriously, this cigar looks like it has had much better days. But there is absolutely nothing wrong with that, and in my opinion, this is a beautiful looking cigar. 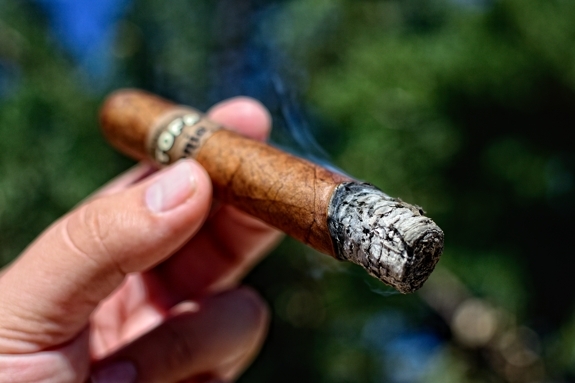 The medium brown wrapper has lots of bumpy, webby, darker shade veins throughout the entire body of the cigar up to the round, Cuban style triple cap. Although the wrapper may look a bit troubled, It’s actually very thick and tough, giving off a beautiful shine as lights reflects off all the crazy oils that coat this cigar. The band has some neat, rustic design to go along with the appearance of this cigar. The band is a neat, brownish purple with “Kristoff” printed in white, “Kristania” printed in black with some interesting design, and “Elite Cuban Taste” along with “Dominican Republic” and “Hand Made” in gold. The cigar itself is really firm, and give lots of pushback as I try to compress it. The wrapper on the Kristania gives off a whole ton of mossy, muddy, earth aromas while the foot has some fun cinnamon, and spice. The Kristoff Kristania clipped like butter against my Palio double bladed cutter. The cold draw is really deep, and meaty, letting lose a very deep woodsy, earthy, spicy flavor. First Smoke: Kristoff’s Kristania lets loose a massive, MASSIVE cloud of insanely thick, white smoke right off the bat. The draw on this cigar is remarkable. 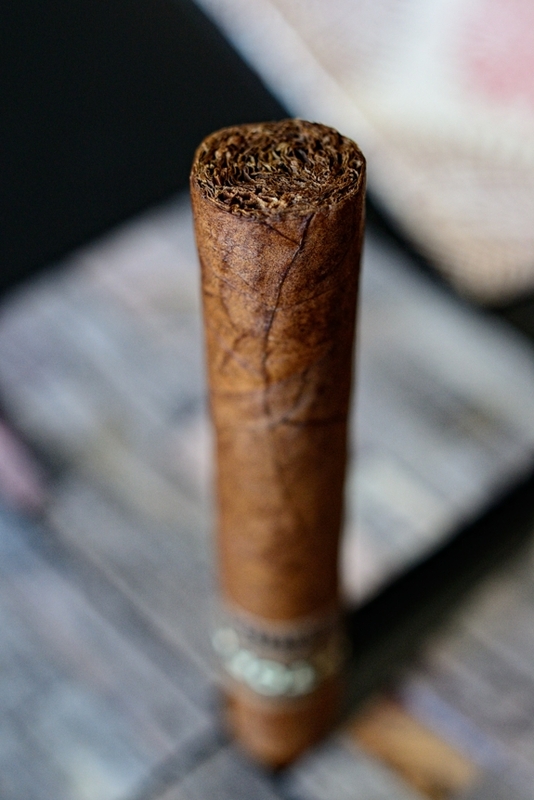 As stated on the band, the cigar actually has some very Cubanesque flavors, starting out with some subtle cedar, lots of earth tones, saltiness, honey, all wrapped in an overall mild approach. 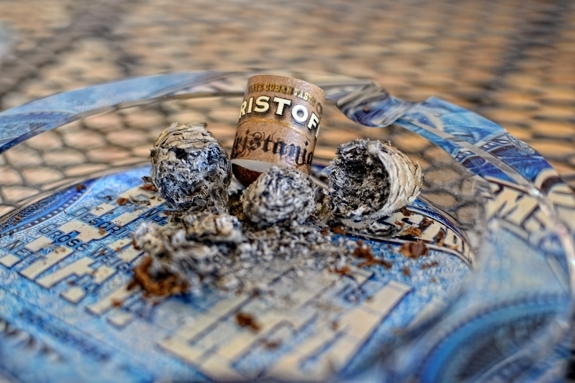 The Kristoff Kristania only lets loose a subtle amount of smoke as it sits in my ashtray, which really resembles the overall mossy, earthy flavors with a matching aroma. The cigar could be burning a bit cleaner as waves continuously form in the first third, but I haven’t had to touch it up yet. The ash is a very bright, and medium grey which is very tightly compacted holding tight for a little under an inch before giving way. Halfway There: I am glad to say that the burn line on this Kristoff Kristania has cleaned up tremendously by itself. It’s now burning razor sharp with only a few slight waves. The flavors are much the same as they were in the first half only with a slight ramp-up in cedar, and a large ramp-up in that mossy-earthy flavor. The only bad thing is the flavors are so mild they are borderline cardboard. I really hope that they changeup into the final third or this cigar may just dud out. The retrohale on this cigar is really nice, and really smooth, faintly coating with a lot of earth and cedar while I feel absolutely no nicotine at all. Finish: Deep into the final third of this Kristoff Kristania and the flavors have still yet to change up. The only added feature to the cedar, mossy-earth tones, and slight cinnamon is the dryness I am getting in my mouth while I smoke it. This is very common and I know that there are certain tobaccos that are actually added to blends to promote the formation of saliva in your mouth. Obviously Kristoff forgot to take that in consideration when blending this cigar. I am still not getting any nicotine at all, nor did I experience any built up harshness all the way down to the nub. The cigar did begin to burn a little hot around the one inch mark though. Overview: I think it’s pretty obvious that I was going to conclude this review on a disappointing note. 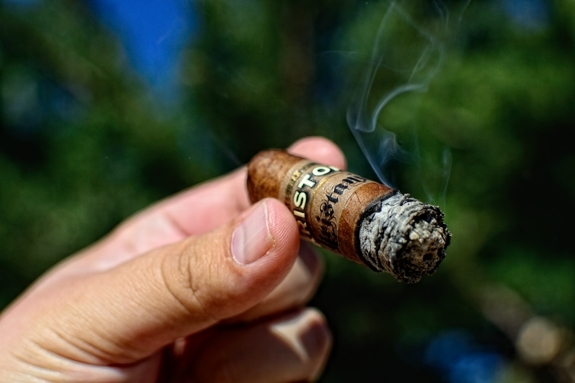 To me, Kristoff cigars have always been hit or miss. Needless to say this one gets filed in the miss section. The cigar has good intentions of resembling Cuban cigars, but falls completely flat in the taste category by doing so. Honestly, this cigar bored me from the start, and continued to do so the more I smoked it. There is a glimmer of hope out there though. This cigar reminded me a lot of some of the standard, popular Davidoff blends out there. If you are a fan of those, like I know so many are, than this cigar is definitely something you will want to look into, especially at the price point. But if you are looking for a cigar with some interesting, or bolder flavors, or a cigar that resembles a Cuban, then I would take a pass on this one. 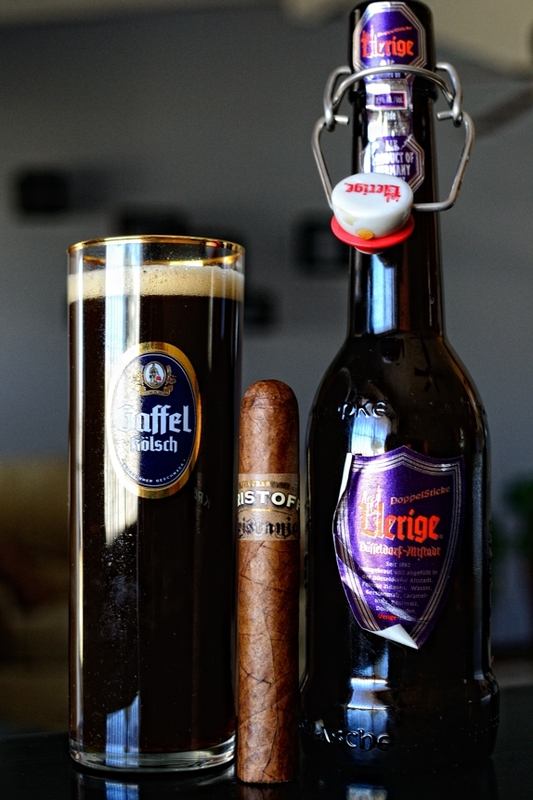 Pairing: Uerige’s Doppelsticke isn’t a stranger to this blog either. This is a hard to find brew, but when I do find it, I buy it in bulk. Doppelsticke is a 8.5% powerhouse brewed at the Uerige Obergärige Hausbrauerei GmbH / Zum Uerige in Germany. This Altbier, and most, if not all other traditional Alts are brewed in Düsseldorf. Old, loosely translates to “Old” describing the longer brewing processes used to create said beer. The strong brown ale boasts of strong, dark malts, caramel, honey, orange, apple, and orange. This is a very flavorful, yet smooth beer that pairs perfectly with just about any cigar, and meaty, hearty meal. The glass I decided to drink this out of is actually an “Altbier” style glass from the Gaffel house in Düsseldorf. My intern at the time visited Cologne and took the glass from the brew house for me. An interesting note on the glass is that at the brew house customers drink from the exact glass minus the gold trim. VIP members are awarded the gold trimmed glass to distinguish their excellence, among with other perks. Sorry to hear I picked a loser for ya but better you than me… Lol. Ive been smoking for about 4 years now and have yet to burn a Kristoff. That thing sure did look pretty as you mentioned but über mild is not my profile. Thanks for the review. See ya on twitter and fb! haha no problem at all bro. Anytime you need something reviewed, just let us know! Thanx for the review. I am not a Kristoff fan and I thank you for your honesty with this stick. I am more intrigued by the Uerige’s Doppelsticke! I have not had this beer but will immediately go out and get me some! Keep up the great work. There are some, like the sumatra, that I really enjoy. Which is strange, cause I don’t really like Sumatra. Anyhow, the beer is just amazing. Track it down! Shame you didn’t like this, this is one of my fav sticks, Oh well smoke what ya like, like what ya smoke right? Totally agree with ya man. I actually went through this morning and started to read some more reviews of this stick, and it looks like I am one of the very few people who didn’t enjoy it. That’s the awesome thing about cigars, the subjectivity. I’m not mad at ya, I’ll still read your reviews lol. Thanks for the review, Tony. I have not yet had a Kristoff. I guess it’s time to pick one up and try for myself. I’m not sure that I’ve ever seen that beer either. My pleasure Jeff! Def try the Sumatra, is my favorite. As far as the beer, I rarely come across it, but I buy as many as I Can when I do! Good review, I thought that Kristoff was a strong cigar,this one sounds like I might like it. Enjoy mild cigars,hope I can find one. My history with Kristoff (like yours) has been hit or miss… I think they are priced to high even when hitting. I have seen this in the B&M, but I am not willing to but them as I have not been overly impressed with the label in general. I did like the Brittania (Connecticut line) but it is relatively pricey for a Connecticut, with better option at that pricepoint. Boring was a good summation of this cigar. Thought I was alone until I read your review.